The members of the Muirfield Village Garden Club have been very involved with the Old Fashioned Christmas Open House at Coffman Homestead. After a lot of research into the Victorian period, members used living materials such as hydrangeas, Osage oranges, pine cones, and apples to decorate the Homestead for Christmas. Come and see their beautiful work! The twinkle of candles, the aroma of hot cider and the sounds of the season will put you in the holiday spirit. Tour the 1860s era home dressed up with festive period decorations created by The Muirfield Village Garden Club. Enjoy musical entertainment, hot cider and cookies. Visit the barn and capture a memory with a photo by the gaily decorated sleigh or by the large picturesque wreath. Admission is only $5 and is free for ages 5 and younger. 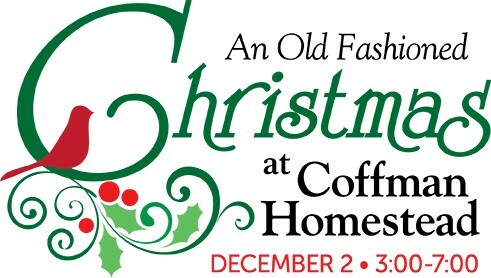 Tickets are available online or at Chelsea Borough Home, 54 S High St. in the Dublin Historic District. This event is presented by the Dublin Historical Society, a non-profit organization whose mission includes preservation of historic sites and a study of local history and The Muirfield Village Garden Club. View the official flyer for this event here. We have great news! 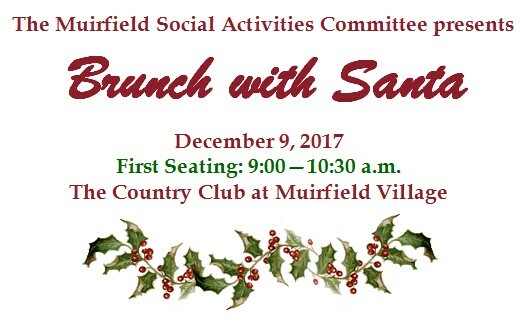 Thanks to the dedication of MSAC members and the Country Club, there is an additional seating available for Brunch with Santa. Enjoy a delicious brunch, crafts, activities, and of course, a visit from Santa! We are only accepting reservations for the early session from 9 a.m. – 10:30 a.m. We are not able to accept reservations for the 11 a.m. to 1 p.m. seating because it is full. We hope to see you there! Email [email protected] with any questions. Even though cold weather has set in, there’s still a few nice days to take advantage of to walk outside. Because we’re concerned for the safety of all residents, we want to remind residents that walking or jogging in the street is not necessarily safe. Sometimes residents will walk in a group down major streets and don't move to the side when cars approach. This is especially dangerous when the sunlight is dim, there is inclement weather of any type, there are curves in the road, or traffic is coming in both directions. Rather than using the streets, we strongly encourage residents to take advantage of Muirfield’s 29 miles of pathways. Maps are online. If you do still plan to use the roadways, please be cognizant of traffic and other dangers in the streets, wear bright and reflective clothing, and be ready to move out of the way if needed. Although motorists should always be on the lookout for pedestrians, it only takes one distracted driver to cause a tragedy. Please stay safe and use the pathways instead whenever possible! The City of Dublin is still collecting leaves in Muirfield Village this week. After this, the week of December 4-8 is the final scheduled pickup for Muirfield Village. To ensure pickup, have your leaves at the curb by 7 a.m. Monday, December 4. Collections will take the entire week to complete. Remember, leaf piles can only contain leaves; not other plant debris, branches, or vegetation. You may notice that the leaf truck seems to be collecting everywhere but on your street. The City of Dublin uses two different size leaf trucks. While the full size trucks will work for many streets, they are too large to use in cul-de-sacs where the turn radius is too tight. This is where the smaller trucks come into action. If it seems you are being skipped, it's more likely that the city is just getting the proper equipment to your property. If you miss the final collection, leaves may be put into paper yard waste bags and set out on Mondays for year waste collection. Yard waste pickup is year-round. Check the city's LeafGo system to track leaf collection progress in real time. Read more about the city's leaf collection program here. The Association office will be closed for the Thanksgiving holiday. We wish everyone a safe and happy Thanksgiving weekend, whether at home or on the road!